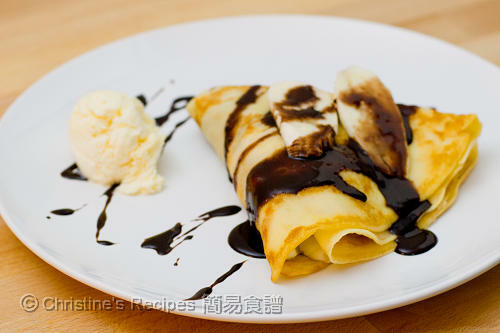 A simple crepe with banana and chocolate sauce is the best for any occasions. Let it be breakfast, morning tea, afternoon tea, or snack for anytime on a day. Its texture is smooth and soft and its taste is heavenly delicious. Pin here to PIN this Banana Chocolate Crepe! When I spotted a crepe maker was on sale at Aldi, it quickly became one of my kitchen gadget collections. Hadn’t hubby encouraged, I would’ve taken one or two more days to consider. You might easily guess who is the person in my family loves to have crepes the most? Back home, off I went to whip up one of his most favourite versions, banana chocolate crepe, which costs 9 dollars each from a dessert bar. With this crepe maker, I can easily make as many good-looking crepes, just like those professional ones, as we like. If you don’t have a crepe maker, you still can make tasty crepe with a non-stick pan. 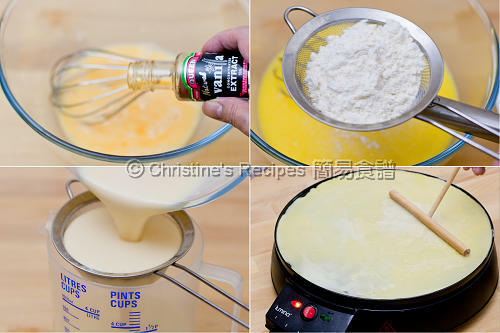 Mix the eggs, butter, milk, sugar and vanilla extract. Sift in plain flour and cornflour. Combine well. Set aside. Put chocolate, sugar and cream in a bowl. Place the bowl over a pot of simmering water, at low heat. Stir occasionally until the chocolate and sugar are completely dissolved. Remove from the heat. Heat up the crepe maker according to the manufacturer’s manual or a non-stick frying pan. Lightly grease the crepe maker or frying pan. Pour about 1/4 cup of the batter for each crepe and cook both sides until lightly brown. Place banana slices and drizzle with chocolate sauce. Fold into a triangle shape. Drizzle more chocolate sauce on top. Served immediately with ice cream or whipped cream if you like. Enjoy! If using frying pan, simply pour the batter, then swirl the frying pan so that the batter coats the surface evenly. 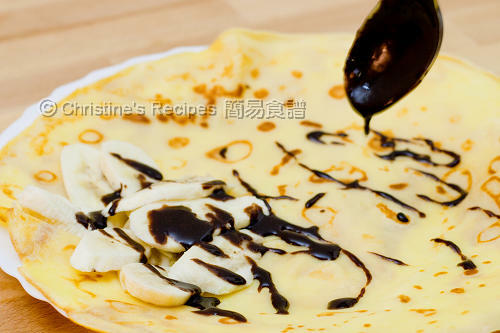 Wow..the crepe look so tempting.Nice recipe. My husband loves pancakes/crepes too. They are mouthwatering! your home-made crepes look thin and yummy. Thanks Christine, love your recipe. Can you give me some ideas to make it crispier? Could add more oil and fry it in a nice and hot pan. I tried your recipe a few months ago and it turned out great! Unfortunately, I can’t eat too much dairy because I sometimes get a stomach ache afterwards. I couldn't find a vegan crepe recipe that I was happy with online so I decided to modify yours a little bit and it turned out just as yummy! I wanted to share the tweaks with you and for anyone else who can't eat dairy. And I think you're right about the corn starch. The other recipes online don't seem to use corn starch and people say theirs turned out more like pancakes.